Character | Breeding high quality Czechoslovakian Wolfdogs for work and shows. This is a relatively new breed of dog, which can boast neither hundreds of years of tradition nor the names of famous rulers or eminent personalities who bred it or owned it. Nevertheless, it attracts attention wherever it appears. Nobody doubts, not for a moment, that these dogs are of the most distinguished origin. Their mother is Nature. It looks like a wolf. It is tall but light and strong. Its straight thick hair is wolf-like grey with a typical white mask. 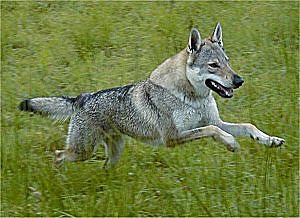 When we started showing Bolton (our first CzW), wolfdogs in Poland were a real rarity (Bolton was the third czechoslovakian wolfdog in Poland). No-one, neither audience, nor judges didn't have an idea what kind of dog breed it is and how to judge it in the ring. But they "knew" their characters.